It was a dark day in Walt Disney World history when Cinderella’s Castle was covered up. Perhaps I should say it was a “pink” day in Walt Disney World history. 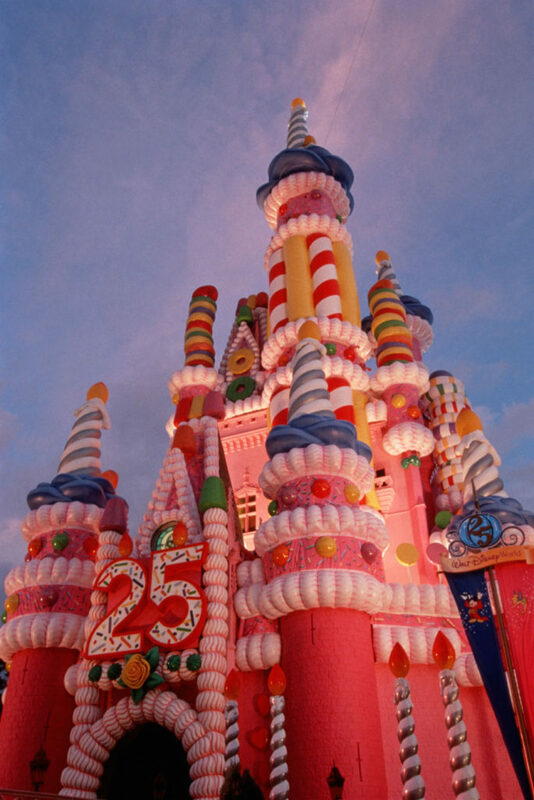 October 1, 1996, marked Magic Kingdom’s 25th Anniversary so Disney Imagineers decided to commemorate this important event by transforming Cinderella’s Castle into a 185-foot pink birthday cake. Unfortunately, true Disney fans didn’t appreciate having the main park icon camouflaged, and especially for 15 months. Not only was the castle painted bright pink, it had inflatable icing, along with huge gumballs, lollipops, Life Savers, gum drops, red candy hearts, green candy stars and, of course, birthday candles! They used more than 400 gallons of pink paint in three different shades. Through the years, Cinderella’s Castle has been decorated in several different ways (cinderellas-castle-in-review/) but none as controversial as the birthday cake. Guests visiting Magic Kingdom during those 15 months didn’t get to see Cinderella’s Castle – a major disappointment for many, especially first-timers. It was rumored that some couples even postponed or cancelled their Disney weddings until the return of the beloved icon. On the other hand, the castle transformation was quite impressive and fun. There’s no way that anyone who visited Magic Kingdom that celebration year will ever forget the giant pink birthday cake with larger-than-life decorations and inflated icing. 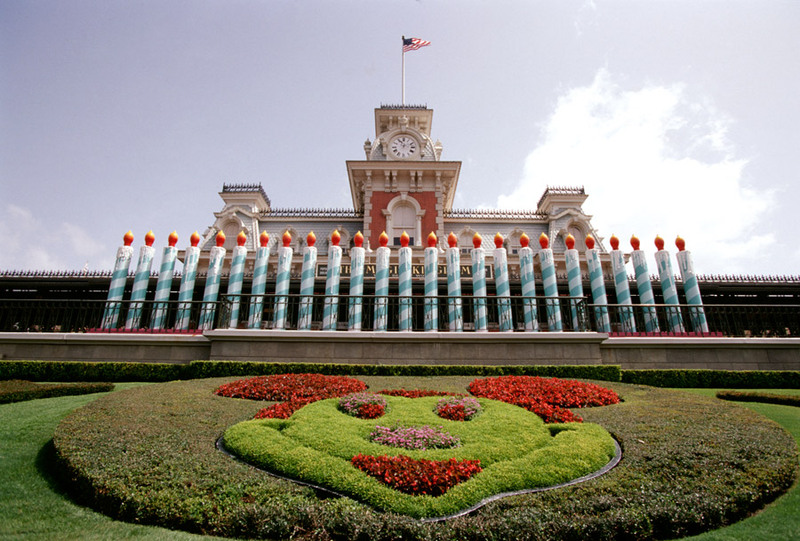 Guests entering the Magic Kingdom that year were greeted by 25 large birthday candles. Once inside the park they could see the large birthday cake at the end of Main Street USA. Not only was the birthday cake impressive, so were the 25th anniversary kickoff ceremonies. Roy E. Disney, CEO Michael Eisner and “first lady” Hillary Rodham Clinton were on hand to begin the 25th Anniversary festivities. 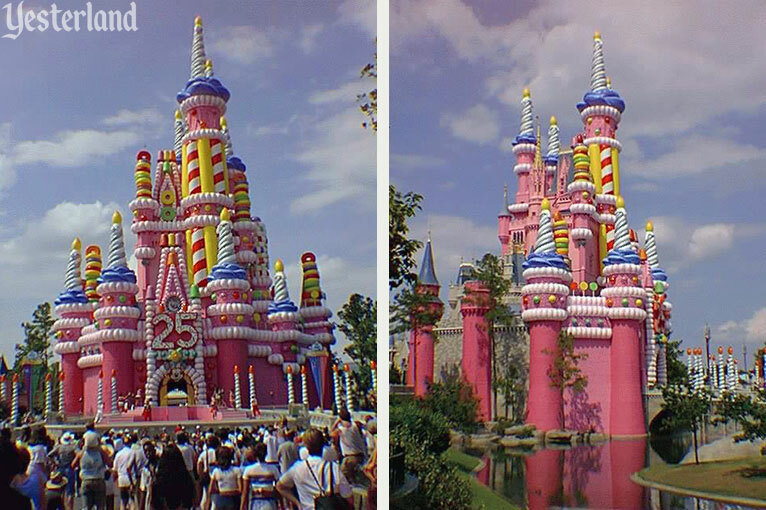 Whether you loved or hated the transformation of Cinderella’s Castle into a giant pink birthday cake, you have to admit it’s the most memorable of all the Magic Kingdom’s anniversaries — the year Cinderella’s Castle disappeared. 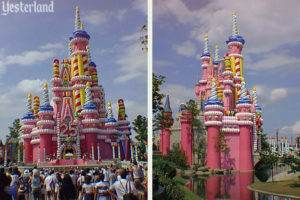 Cinderella Castle, Magic Kingdom Anniversaries, Pink Birthday Cake. Bookmark.